The judge rejected Manafort's claim that Mueller's mandate is too broad. Paul Manafort’s latest request to have one of special counsel Robert Mueller’s indictments against him thrown out was shot down Tuesday when a federal judge in Washington rejected the former Trump campaign chairman’s claim that the special counsel’s investigative mandate is too broad. Judge Amy Berman Jackson roundly rejected Manafort’s motion to dismiss the special counsel’s indictment, citing several examples of legal rectitude for Mueller’s aggressive investigation of Russian meddling during the 2016 presidential campaign. “The indictment falls squarely within that portion of the authority granted to the Special Counsel that Manafort finds unobjectionable: the order to investigate ‘any links and/or coordination between the Russian government and individuals associated with the campaign,’” Jackson wrote on Tuesday. The special counsel’s office declined to comment on Jackson’s memorandum opinion. Manafort, 69, was indicted and pleaded not guilty in two criminal cases brought by the special counsel related to charges of money laundering and tax evasion, among other things. Trump’s former campaign chairman has mounted multiple legal challenges to the criminal cases against him in Washington, D.C., and Virginia by arguing that Deputy Attorney General Rod Rosenstein and Mueller had exceeded their authority to investigate and charge him. “The case did not arise in a vacuum, and the special counsel did not create his own job description,” Jackson wrote on Tuesday in defense of Mueller. 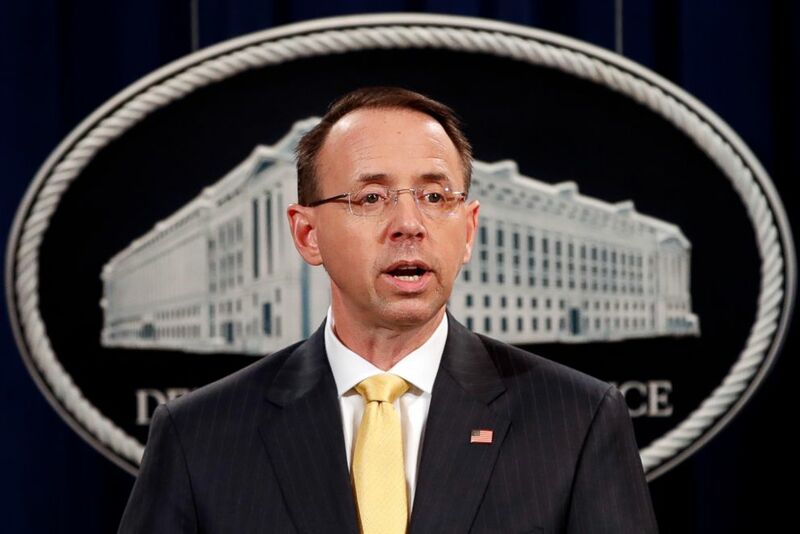 (Jacquelyn Martin/AP, FILE) Deputy Attorney General Rod Rosenstein, speaks to the media with an announcement that the office of special counsel Robert Mueller says a grand jury has charged 13 Russian nationals and several Russian entities, Feb. 16, 2018, in Washington. Earlier this month, Judge T.S. Ellis, a federal judge in Virginia, questioned the scope of Mueller’s investigation, at times warning against “unfettered power” and calling attention to the fact that charges against Manafort predate his time on the Trump campaign. “None of it had any relation to the campaign,” Ellis said during the April 4 hearing. Later that day, Trump praised Judge Ellis as “really something very special...he's a respected person" during his address to the National Rifle Association. Jackson, in her Tuesday memorandum opinion, appeared to push back on Ellis’ skepticism of the special counsel’s broad mandate, arguing that Rosenstein granted Mueller the power to investigate “any matters that arose” from his immediate probe of Russian meddling. Manafort’s trial in Virginia is scheduled to begin on July 10, and his Washington, D.C., trial is slated for September.